Description: Peters and Reed Vase. Most commonly called a trumpet vase, but also known as a corset vase or carnation jar. Wilse blue, high gloss glaze. According to my resources, this vase was made between 1921 and 1926. 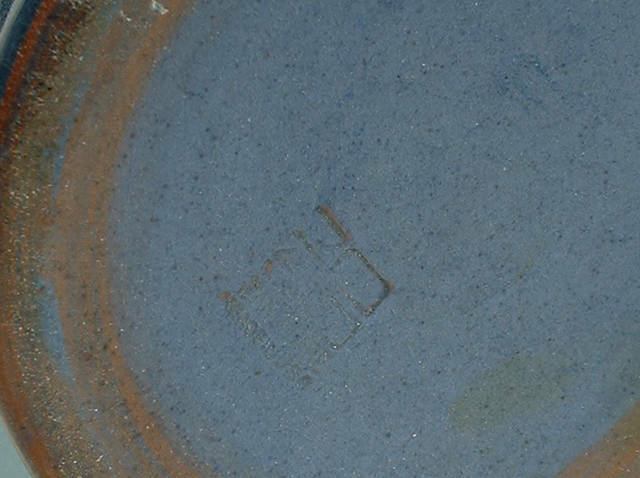 Marked with the the Zaneware mark as shown. 8 inches tall. Red clay. There are some green spots in the glaze, but I truly don't believe they occured after the piece was made. Most likely happened during firing. The vase is in unbelievable condition. No chips, cracks, scratches. Some very mild crazing inside, and a little scuffing where it contacts the self when sitting.